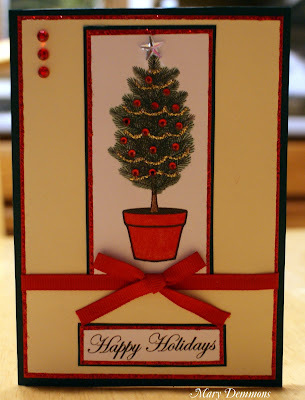 I made this Christmas card using this tree image from Wink Wink Ink. I added gold stickles, mini red gemstones and a clear star gemstone. I aslo added Christmas red stickles to the red cardstock. Very nice Mary. Very clean & well blinged up! What a alovely card, so traditional but with a real feel of elgance to it. What a beautiful card, I love that gorgeous tree. Thanks for playing along at Sir Stampalot this month.